I know I've shared this before, but for all of those who weren't visiting last time, it's worthy to repeat. It's one of the priceless nuggets I got from my daughters. You may have every right to feel the way you do, but if it isn't profitable to you, change it! For today's freebie I'm giving you a word art made using my kit, Spring Chicks, so you can sample the kit. 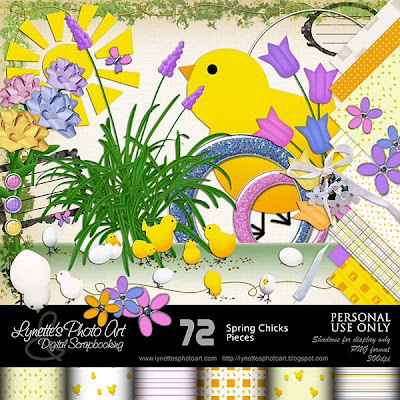 It's a fresh and happy kit with a whopping 72 elements including 8 different chicks, 5 different egg's in various stages of hatching, bow flowers, journaling stamps and metal rimmed elements! Click here for full details. Click image to enlarge. Click Buy It Now button under image to purchase for $3.99 at my PayPal store. Ohhh so sorry! Thanks for telling me. It's fixed now.